"Ranobe" redirects here. For Madagascar locality, see Berevo-Ranobe. For the science fiction novel entitled Light, see Light (novel). Not to be confused with visual novel or graphic novel. Light novels are an evolution of pulp magazines. To please their audience, in the 1970s, most of the Japanese pulp magazines, which had already changed from the classic style to the popular anime style covers,[clarification needed] began to put illustrations at the beginning of each story and included articles about popular anime, movies and video games. The narrative evolved to please the new generations and became fully illustrated with the popular style. The popular serials are printed in novels. Very often light novels are chosen for adaptation into anime, manga, and live-action films, and some of them are serialized in literary magazines such as Faust, Gekkan Dragon Magazine, The Sneaker and Dengeki hp, or media franchise magazines like Comptiq and Dengeki G's Magazine. Publishing companies are constantly searching for new talent with annual contests, many of which earn the winner a cash prize and publication of their novel. The Dengeki Novel Prize is the largest, with over 6,500 submissions (2013) annually. They are all clearly labeled as "light novels" and are published as low-priced paperbacks. For example, the price for The Melancholy of Haruhi Suzumiya in Japan is ¥540 (including 5% tax), similar to the normal price for trade paperbacks—light novels and general literature—sold in Japan. 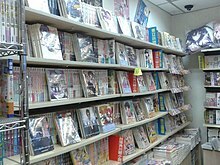 In 2007 it was estimated (according to a website funded by the Japanese government) that the market for light novels was about ¥20 billion (US$170 million at the exchange rate at the time) and that about 30 million copies were published annually. Kadokawa Group Holdings, which owns major labels like Kadokawa Sneaker Books and Dengeki Books, has a 70% to 80% share of the market. In 2009, light novels made ¥30.1 billion in sales, or about 20% of all sales of bunkobon-format paperback books in Japan. There are currently many licensed English translations of Japanese light novels available. These have generally been published in the physical dimensions of standard mass market paperbacks or similar to manga tankōbon, but starting in April 2007, Seven Seas Entertainment was the first English publisher to print light novels in their original Japanese Bunkobon format. Other English-language publishers that license light novels are Tokyopop, Viz, DMP, Dark Horse, Yen Press and Del Rey Manga. The founder of Viz Media, Seiji Horibuchi, speculates that the US market for light novels will experience a similar increase in popularity as it has in the Japanese subculture once it becomes recognized by the consumer audience. Most light novels are published by Japanese writers, with very few exceptions. For example, Yū Kamiya, author of No Game No Life, is a Japanese-Brazilian writer who lives in Japan and publishes his novels through major Japanese publishing labels. Popular literature has a long tradition in Japan. Even though cheap, pulp novels resembling light novels were present in Japan for years prior, the creation of Sonorama Bunko in 1975 is considered by some to be a symbolic beginning. Science fiction and horror writers like Hideyuki Kikuchi or Baku Yumemakura started their careers through such imprints. Dengeki Bunko writers continued to slowly gain attention until the small light novel world experienced a boom around 2006. After the huge success of the Haruhi Suzumiya series, the number of publishers and readers interested in light novels suddenly skyrocketed. Light novels became an important part of the Japanese 2D culture in the late 2000s, with series such as A Certain Magical Index selling large amounts of copies with each volume release. The number of light novels series put out every year increases, usually illustrated by the most celebrated artists from pixiv and the most successful works are adapted into manga, anime, games and live action movies. Since the mid 2000s with the advent of the internet, publishers began to contact authors of popular stories on their blog, website or sites for publication of novels like the biggest one Shōsetsuka ni Narō to adapt those works into print edition for the Light Novel format with an editor and illustrator. Popular works like Sword Art Online, That Time I Got Reincarnated as a Slime, Overlord, Re:Zero and Konosuba were originally popular web novels that got contacted by a publisher to distribute and publish those stories in print format. ^ 榎本秋 (Aki Enomoto) (October 2008). ライトノベル文学論 [Light Novel Criticism] (in Japanese). Japan: NTT Shuppan. ISBN 978-4-7571-4199-5. ^ "The Platform to Produce Innovative Content - Kadokawa Annual Report 2012" (PDF). p. 11. ^ a b Light Reading, Pop Culture, Trends in Japan, Web Japan . ^ "How 'not' to write a Light Novel". The Ranobe Cafe. 3 September 2009. Archived from the original on 30 April 2012. Retrieved 5 March 2017. ^ "SFWA Novel Categories". Science Fiction and Fantasy Writers of America. Archived from the original on 19 March 2009. Retrieved 5 March 2017. ^ "The Dengeki Novel Prize's official website" (in Japanese). ASCII Media Works. Retrieved 2013-08-31. ^ "Publishing heavyweights see light in growing 'light novel' market". The Asahi Shimbun. Archived from the original on 15 December 2013. Retrieved 30 November 2011. ^ "Seven Seas Entertainment Launches New "Light Novel" Imprint". 2006-09-13. Retrieved 2007-05-08. ^ "Horibuchi on Manga ICv2 Interview--Part 2". ICv2. Retrieved 20 March 2012. Wikimedia Commons has media related to Light novels.